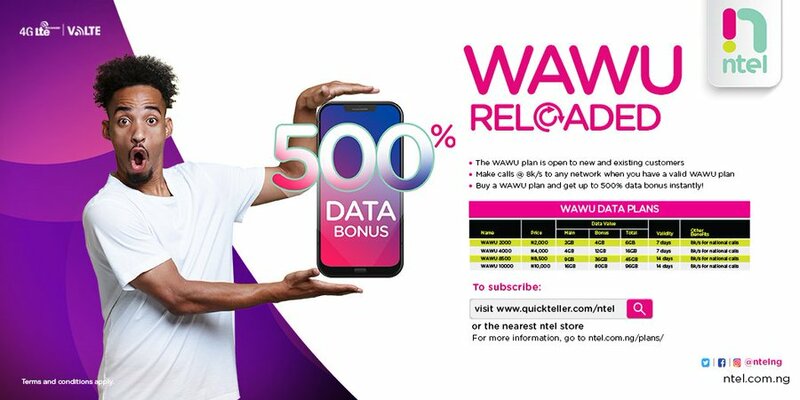 After discontinuing Wawu plan few weeks ago, Ntel took another bold step to resurrect the plan and called it WAWU Reloaded, which promise to give you 500% data bonus. They made the announcement on their social media pages. The Wawu plan we know then gives us 12GB for N1000 and 24GB for N2,000 which is valid for 30 days. But now, those plans are no longer available. Ntel has revisited those plans and many customers are not happy with it. Without wasting much of our time, let's see what the new Wawu plan has to offer. This offer is available to both new and old customers. All you have to do is, buy a WAWU plan and get 500% data bonus instantly!!! Visit http://quickteller.com/ntel to subscribe. This is really a massive increase if you ask me. Let me know what you think below.